Does this lattice have a name (and literature)? The "lattice" in the title appears to be a lattice. At least it's a poset, which I define now. Fix a partition $\lambda$ of $n$ and consider the set of all standard Young tableaux (each of $1,\dots,n$ occurs once in the tableau, and rows and columns are increasing) with shape $\lambda$. We define the poset by saying that $T'$ covers $T$ if $T'$ can be obtained by swapping the positions of entries $i$ and $i+1$ in $T$ for some $i$, such that $i$ moved to a strictly lower row. Thus the $T'$:s covering a fixed $T$ are those given by swapping $i,i+1$ not in the same row or column such that $i$ is in a higher row than $i+1$. 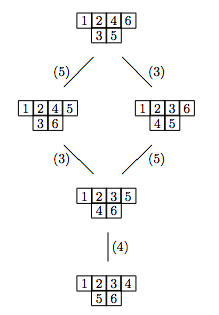 I drew this poset for a few $\lambda$ and observed that it was a lattice. Your poset is either the same or closely related to the one in http://www.fh-bingen.de/fileadmin/user_upload/Lehrende/Winkel_Rudolf/06.pdf, which is a lattice. Not the answer you're looking for? Browse other questions tagged co.combinatorics posets young-tableaux robinson-schensted-knuth or ask your own question. What is the most general “two in one row for A & in one column for B” theorem?